Doorstep deliveries of milk have fallen, but milkmen are launching an online service to prevent them becoming an endangered species. Milk delivery services are fighting back after a decade of sharp decline, with the launch of a website which promises to match up potential customers with their nearest delivery service. The website - www.findmeamilkman.net - will seek to revive deliveries in urban areas where the milk round has been replaced by the supermarket run. Milk delivery companies are already diversifying - supplying bread, eggs, vegetables, fruit juices and soft drinks. And they have also experimented with special offers such as books. The industry body, Dairy UK, says bin liners, garden compost and kitchen foil have all made their way into the milk round. A spokesperson for Dairy UK says there is a growing trend towards home deliveries, driven by online shopping, and milk companies want to remind customers that they can also get their milk delivered to the door. Once a familiar figure, the traditional milkman has been marginalised by changing social patterns, says Dairy UK. People now buy milk in cheap, open-all-hours supermarkets, and the increase in people living alone and families where both parents are out at work has ended the days when the milkman went around each week collecting payment. The launch of the milk delivery website wants to make sure that milkmen don't disappear entirely as they offer a "tremendous lifeline for the community, particularly the elderly". But these delivery services depend on finding people willing to get out of bed to begin work in the middle of the night. According to Express Dairies' diary of a milk delivery person, it's a life that suits an independent self-starter, with no fear of the alarm clock. "Being a milk delivery person is not the life for the faint-hearted. I work outdoors in all weathers, usually starting my round at around 3.30am," says the milkman's diary. "This means that I usually get out of bed at 2.30am, drive to the depot (no traffic about at this time so no traffic jams) and load my vehicle with about 30 crates of milk and a selection of goods. A quick cup of tea and I am off to my rounds delivery area. "It may seem strange but I really enjoy my job. I am able to work on my own, at my own pace (remembering that people like their deliveries early) and by using my hand held computer I have all of the information I need to ensure that all of my customers get their correct orders delivered to the right place." Dairy UK estimates there are 9,500 people delivering milk - and the organisation's director general, Jim Begg, says there is still a strong demand. "There is no doubt that consumers like having the milkman around," he says. For many, the milkman represents an essential lifeline to the outside world, but more and more people are recognising the lifestyle benefits of home delivery." But figures from another industry organisation, the Milk Development Council (MDC), show the extent of the decline in milk deliveries. A decade ago, more than 2.5 billion litres of milk were being delivered to the doorstep each year, which by 2004 had fallen to 637 million. Only 13% of the milk now consumed at home comes from delivery rounds. This collapse - with the amount of milk delivered to the doorstep falling by half between 2000 and 2004 - has been created by changing patterns in shopping, says the MDC. People are going to the supermarket more regularly - and don't need their pints delivered each morning. It's also cheaper to get milk from the supermarket than from home delivery. And a spokesperson for the MDC says there appeared to be a cultural change. 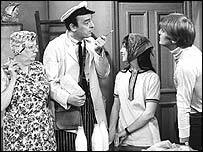 The milkman, once a familiar local sight and a regular fixture of sit-coms, "seemed to have been lost somewhere". With the price of a delivered pint of milk at 45p plus delivery and a supermarket pint at a fraction of this it's no wonder peoples habits are changing. I still have mine delivered as I think that the delivered milk tastes nicer. I liked having my milk delivered. 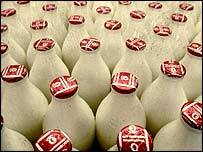 However kids would steal it, and the milk man always came around too early in the afternoon to collect money. It was very inconvenient, plus it's far easier to buy in a supermarket now, and pay by a variety of ways, including plastic. In my previous area, milk was delivered by 2am in the morning. After being out for a few hours during the summer mornings the milk would not last as long. When i buy milk, i want it to last at least 6 days, my delivered milk didn't till the end of the next day in summer. There was also no choice on getting organic milk either. Would love to have a milkman but I know that the milk would be stolen from doorstep. I went back to having a milkman deliver this year. Good service, fair prices and a fight back for the 'little man'. I hope it continues. As a young lad, I used to help out our local dairy on a saturday morning, travelling round the villages, dropping off people's pints, bread and so on. It always amazed me that the customers were almost pleased to see us, stopping to chat about this and that, particularly the more elderly people who saw us as a means to talk to the outside world. It'd be a real shame if milkmen were to disappear altogether - in remote & rural areas, they can provide a vital "pipeline" of fresh produce to those people who for whatever reason, are unable to get to a supermarket regulalry.